What are we trying to accomplish in information literacy sessions? One thought, in addition to the deep structure we already touched on in this blog, we are attempting to build the foundations for developing expertise in academic research. Which is absolutely true. We are not going to create experts in under an hour. 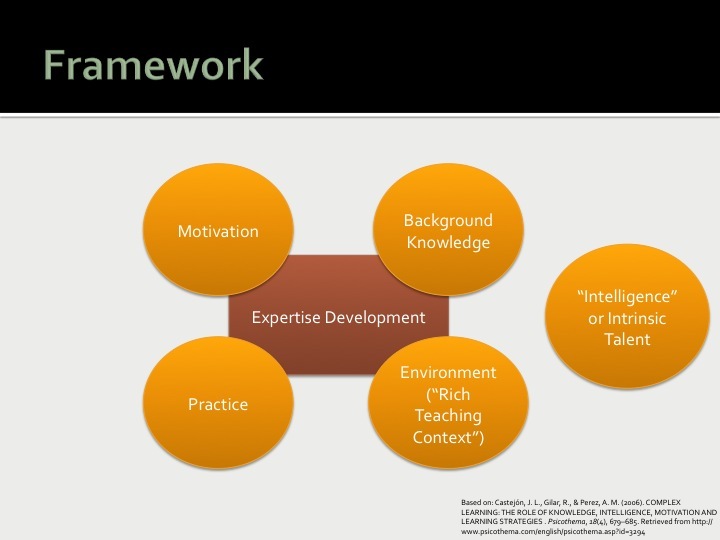 What we can do, however, is set students up for later success, and take our inspiration from the expertise literature. In Daniel Willingham’s Why Don’t Students Like School? (Chapter 6), he explains that experts and novices are inherently different in the way that they think; that’s why activities designed to make students “think like an expert” don’t usually succeed. There’s necessary scaffolding that needs to happen before someone is going to be able to think like Watson and Crick–that is, transfer their knowledge to new domains and create new knowledge. As I noted earlier, it takes about 10,000 hours of deliberate practice to achieve expertise in any discipline, from playing an instrument to applying textual criticism (2). We don’t even have .0001 of that time with students, most of the time. What we can do, though, is model what practice, particularly deliberate practice, looks like, and build in time for it in our IL sessions. This is why that 15-20 minutes or so that you build into your session for students to begin their research, with you (the research expert) is so critical: It provides a solid chunk of time where students can focus on applying the IL skills they just learned, which increases the likelihood that those skills will stick. Repetition is crucial. When I completed a training internship with a library vendor, we learned a nice little saying from Dale Carnegie: “Tell them what you’re going to tell them; tell them; tell them what you told them.” This has actually fallen out of favor in public speaking recently, but it is a nice memory trick for instruction: Keep bringing the information to the forefront of memory, and have students practice what they’ve learned multiple times (though in increasingly complicated ways–not just saying the same thing over and over). In the long-term, this kind of practice automates these activities and allows for chunking. Draw on what students already know, from previous IL sessions, homework you assigned before, etc. Scaffold like a BAMF. This directly ties to practice, and, by connecting to what they already see as valuable, you’re also getting to motivation. Connect your session to an assignment. Every time. Set stakes for the students–“If you pay attention in class today, you will be able to find the scholarly articles you need for your research paper.” Tell them explicitly why they should care, because not all of them are going to immediately see the connection or have intrinsic motivation. I often try to set this up at the beginning of class by sharing an overview of what we’re going to do in the session (a less formal version of learning outcomes) and connecting that to why that’s going to be helpful to them. Your session should create a “rich teaching context,” meaning a place where students can receive expert feedback on the work that they are doing. This can extend beyond the immediate session–make sure there are opportunities for students to work one-on-one with you, or work with the faculty member to create IL rubrics. This also speaks to allowing time for students to work (maybe in an active learning exercise) with you providing constructive feedback and asking guiding questions. OK, well, we can’t do much about this one in a classroom. The good news is that, in the expertise literature, intrinsic talent only gives future experts a boost at the beginnings of their practice (think piano prodigies who reach a point where they still need to practice all the time in order to become concert pianist level–their long-term success is usually explainable by their additional practice, which they enjoy more than someone who is not “gifted”). (1) For related concepts: Chapters 4 (p. 42-45) and 5 (p. 55-60), Reflective Teaching, Effective Learning, by Char Booth. (2) For the seminal article on chess players, see: Simon, H. A., & Chase, W. G. (1973) Perception in chess. Cognitive Psychology, 4, 55-81.